TechCrunch50 was held at The Concourse at the San Francisco Design Center from September 8 -10. The venue walkthrough begins at the door and ends in the main hall during the presentation. The presidential election of 2004 delivered the first recognition of bloggers into the credentialed coverage of the Democratic and Republican Nation Conventions. That year the DNC hosted 40 bloggers and the RNC let in a mere 12 bloggers. Roll the clock forward to 2008 and the RNC has credentialed nearly 200 bloggers and will not make a distinction between them and all other journalists and media organizations. Major developments in the ease and low cost of production have generated an explosion of indie media in 2008. Blogging has transformed into microblogging with services like Twitter and it’s open source alternative Identi.ca. Online video has transformed from YouTube to Qik and even more powerful platforms like Mogulus have provided the tools to integrate all forms of indie media into full featured interactive TV. Many of these tools are still in beta state, but their existence along with the build out of faster mobile networks have freed the production of media from multi-million dollar broadcast studios to the mobile phones in everyone’s hand. “We the media” has arrived. Not only are corporate media organizations coordinating and cooperating with indie media producers and bloggers, but many protagonists are by passing CNN, ABC, NBC, CBS and other news organizations to engage in conversations directly with the public and their constituents. The role model for early adoption is Representative John Culberson (R – TX). Culberson not only established a presence on Twitter, but he regularly engages in dialogue with anyone in the network who attempts to communicate with him. Further, Culberson regularly posts video from outside the House chamber on Qik. All of this Rep. Culberson does using his Nokia N95 for video and his Blackberry for Twitter. A number of Republicans have followed John’s example are now engaging with the public using mobile social media and publishing tools. I considered my own coverage of the Republican National Convention pondering what I might add to the obsessive commentary and observations by cable news, network news and blogger pundits, wonks and journalists. The short answer is: nothing. But what I could add of value is to train and equip actors and protagonists of the RNC, itself. I can enable the creation of a view of the convention from the people who are behind-the-scenes presented and duplicated by all other media outlets. Thus was born GOP Unconventional. Mobile Technology plays a major role in the production of GOP Unconventional. With the help of sponsors including: Cradlepoint Technology, Qik and Mogulus and using powerful mobile devices like the Nokia N95 and other smartphones GOP Unconventional will deliver workshops on the use of the technology for creating a unique and “unconventional” perspective on the event. We are still looking for additional sponsors to support the creation of media and also to provide giveaways which will go to lucky audience members during the week of Sept. 1 – 4. Stay tuned to the site for more information on show times and how you can win some of the mobile technology we use to create GOP Uncoventional. You can follow us on Twitter too at GOPUnconvention. Twitter didn’t allow the enough letters in the id to get “al”on the end. Word came about 2 weeks ago that I’ve been approved as media for the GOP Convention. Cool. I’m very much looking forward to meeting John Culberson, and talking about his experiences in becoming a real-time representative. Video and live streaming will certianly be part of what I plan to produce along with some mixes and remixes. There are more than a couple of techniques that I’ve learned since CTIA on improving sound of the video which is critical. A couple of other improvements will be featured either before the convention or at the convention as they are used. You can probably imagine the areas of improvement if you’ve A) attempted to create videos with your mobile device using one of the streaming services or B) had painful experiences watching the live videos. The indie media tool kit for mobile reporting is something I plan to share once the final products are selected and tested. I’m also looking for more sponsors for the GOP convention productions, so if your company would interested in this opportunity please contact me for more information at mojo@mobilejones.com. More about this as things progress and the new design for mobilejones.com takes shape. Another mobile video captured with a Nokia N95 8GB recorded locally featuring Louis Libin who discusses the challenges with coordination of all wireless communications at both the Democratic National Convention and the Republican Natonal Convention this summer. Supervising Producer at MTV Mobile, Michael Scogin talks about the Choose or Lose project and MTV’s future plans for citizen journalism. 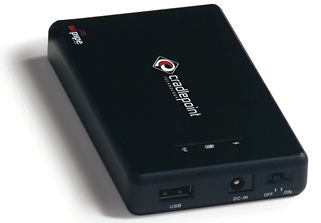 Congratulations to my new favorite tech gadget company Cradlepoint for today’s acquisition bySierra Wireless. Sierra Wireless expands their product offerings from wireless data cards and embedded modules which provide connectivity to mobile networks from PCs. My Cradlepoint PHS-300 also called a “Personal Wi-Fi Hotspot” is used to connect my Nokia N95 GSM device to the faster EVDO Rev A network. Rev A uplink connection is a zippy 1.8 MBs, in contrast to the GSM carriers in the US who top out at 700 kbs. The N95’s Wi-Fi radio makes this solution possible. Many mobile devices are beginning to ship with a set of three radios: CDMA or GSM, Wi-Fi and Bluetooth. It’s liberating to choose the best network for connectivity and have the compatibility problem solved by a Wi-Fi bridge. Adding mobility to the solution, the PHS-300 is battery-powered with a battery-life of 2 hours. Pat Phelan telecom distruptor and entrepreneur of CubicTelecom first alerted me to the Cradlepoint as the right solution for capturing and streaming video over US CDMA networks. The deal is good news for Cradlepoint and good news for Sierra Wireless who now face stiff competition from Qualcomm’s Gobi in the embedded mobile broadband connectivity market. Cradlepoint is well positioned to continue innovating with SWIP’s resources and SWIR expands it’s product suite. Our mission is to make sure we support as many handsets and modems as we can…we’ll be the Mobile Broadband Router division of SWIR, and will remain intact as an organization. Of course, we’ll continue to innovate with new clever products, features, and ideas! The current list of supported cards and devices is as follows. The PHS-300 was the perfect solution for increasing upload speeds by using the EVDO Rev A network and enhances the quality of streamed video as I produced during CTIA last week. The last remaining piece to the puzzle is use of an external mic. This solution is being addressed by Nokia and I’m hoping to report on it very soon. In less than a week, CTIA 2008 kicks off in Las Vegas. The conference is self-proclaimed as the largest wireless conference in the world. Some might argue that “the conference formally known as 3GSM” is bigger. I’m not sure. What I can say for sure is that the big boys from the wireless industry are getting together in the desert, and this uptight overly formalized event needs a big dose of Social Media. CTIA is an organization primarily representing the America’s carriers by a bevy of lobbyists and lawyers. It isn’t the free wheeling environment of SXSW, and certainly not the event where social media practitioners preach to the converted. All of which I believe makes it the idea event to go all out with social media and indy production. So, next week in Las Vegas Bena Roberts, founder and chief editor of the awesome blog GoMo News and I, as the newly appointed US Editor for GoMo will bring a compelling social media experience to the conference. We kick off with an invitation only party Sunday night, March 30th at the Hard Rock Cafe to unveil our mobile video broadcast studio. An RV brightly marked will cruise up to the Las Vegas Conference Center and pick up our interviewees who will be whisked away from the saturated towers serving the CC. We’ll set up to stream from the RV and go live with a variety of pioneering people and innovative companies along side the big brands that fuel mobile content and services. Watch GoMo News for all the up to date information on where and how to watch the broadcasts. The Sprint EDVO Rev. A network with it’s 1.8MB upload capability will provide the bandwidth we need and a couple of Nokia N95s will be the video capture devices. How are we using N95s on a CDMA network? I’ll reveal that during the week. In addition, Flixwagon is a sponsor of GoMo News on Wheels! and will be used as the service to stream from the device, store the videos and alert Twitterfollowers or Flixwagon fans that a new video is LIVE. The interviews and product demos are designed to be informative and conversational. Our audience will be invited to join in with their own questions through chat during the broadcast. We want to encourage respectful participation and exchange. Ask your own questions, and I’ll pass along as many as I can. As a preview, Tuesday, April 1st between 9:15 and 9:30 AM I’m interviewing Louis Libin, who serves as Chairman, Political Conventions Communications Committee. The Committee is responsible for coordinating all the wireless users for the Democratic and Republican Presidentials Conventions and events surrounding the conventions. The users include the broadcasters, Law Enforcement, the organizing committees and others. We start March 30th approximately 9PM Mountain Daylight Time, MDT, (GMT -7). See you there. We are grateful to GoMo News on Wheels! sponsors: Flixwagon, mPulse, MCN, and Smaato. And to the GoMo News Blender sponsor JumpTap.